After a dramatic season of litigation and national outcry resulting from the fatal shooting of Michael Brown by now-ex-officer Darren Wilson, police in Ferguson, Missouri are trying something new. In a complete one-eighty from their prior tactic of brandishing machine guns on patrol, the Ferguson Police Department is the first police agency in the country to train officers to use the Alternative, a gun attachment that makes bullets less lethal. The Alternative attaches to the end of an officer's gun and encapsulates the first bullet he shoots, surrounding it in a casing that stops the bullet from penetrating a target's skin and instead just sends "a shock wave of pain" through them. 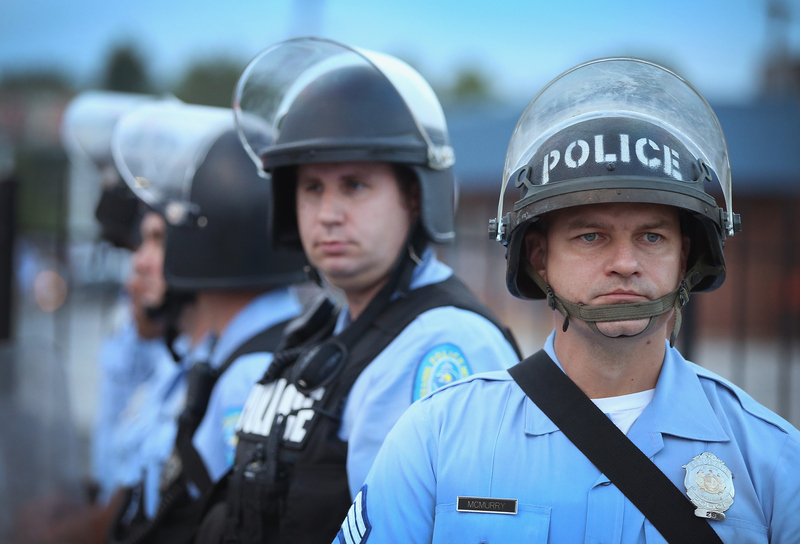 According to The Washington Post, five Ferguson officers will train to use the device this week. Eventually, the city's entire 55-person police force will be trained to use the Alternative. The new device consists of a bulbous metal alloy sphere that can travel up to 250 feet per second when attached to a 9 mm bullet. Alternative Ballistics has developed an innovative device, which allows an officer the ability to choose another option in lethal force situations, while keeping themselves safe. THE ALTERNATIVE™ will incapacitate an individual through blunt force trauma with a diminished risk of death. Christian Ellis, chief executive of Alternative Ballistics, told The Washington Post he calls the device — whose patent he purchased from a retired sheriff's officer — "an air bag for a bullet." The device probably doesn't feel much like an air bag to the person it hits — it can shatter ribs and cause internal damage — but "it's most likely not going to kill you." Ferguson assistant police chief Al Eickhoff said he "really liked" the Alternative. "You are always looking to save a life, not take a life," he told the Post. After the public backlash to what many Americans say is evidence of police brutality, Eickhoff is looking for any way to reduce fatalities resulting from police shootings. But some officials don't think "less lethal" is always the answer. The Alternative requires that, if in a situation where they feel it is necessary to incapacitate someone, officers take a few seconds to retrieve the device from their holsters and attach it to their guns. "I am all about less lethal," Steve Ijames, a former Missouri police major, told the Post. But he added, "Deadly force is the most likely thing to repel deadly force." One question on everybody's mind is whether the Alternative could have saved Michael Brown's life if Darren Wilson had used it back in August 2014. Since no police agency in the country has used the Alternative in practice yet, we have no way of knowing how — or whether — cops will use it under real stress, especially in split-second situations. And, according to Ellis, the device has never been tested on a real human being: it's only ever been used in target practice. So could it have spared Brown's life? Considering that Brown allegedly kept approaching Wilson after he had already been shot with a barrage of bullets, Eickhoff said the Alternative probably would not have stopped him. "You could still shoot him with this round, and he could still get up and come at you," he said.